The ROADrule CEVNI is a quick reference tool that identifies navigation aids and markers as prescribed by the European Code for Inland Waterways. It takes a large amount of complex information and makes it easy to understand. 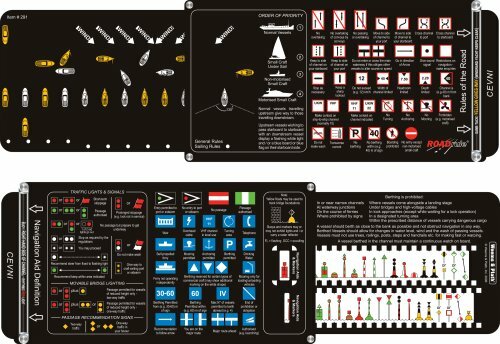 Displays 38 Navigation Aid Definitions. Displays 12 Rules of the Road. Magnifying lens for clear readability of definitions.